Real Madrid has gone through to the Spanish Copa del Rey quarter-finals, after bouncing back from a 1st leg 2-1 loss, with a clear 4-0 win against Celta de Vigo, at the Santiago Bernabéu. As usual, Cristiano Ronaldo stole the show this Wednesday night, with a splendid performance and another career hat-trick. Near the end of the game, the Portuguese forward received a well deserved standing ovation from the fans at the Santiago Bernabéu. Cristiano Ronaldo's response to the FIFA Balon d'Or 2012 outcome was given on the pitch this Wednesday night, with the Portuguese star performing at his finest level and bagging his third hat-trick of the season. 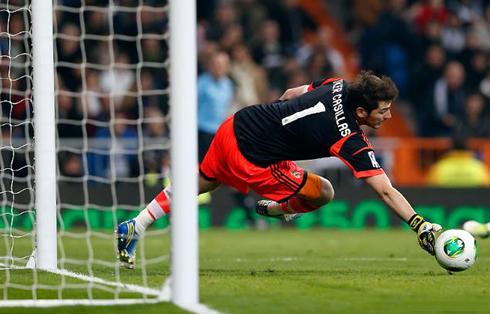 Real Madrid defeated Celta de Vigo by 4-0, after having suffered a 2-1 loss in the 1st leg. The 2013 calendar year couldn't have started in a better way for CR7, who already counts with 5 goals in only 2 games played so far. There are no doubts that Cristiano Ronaldo is by any scope of analysis the most crucial player in Real Madrid these days and since his arrival at the Spanish capital, he already scored 174 goals out of 172 games! The next Copa del Rey opponent will be Valencia CF, at the competition's quarter-finals. The first leg is already scheduled, and it will take place right next week. Real Madrid's defence is still missing a few important players, as it is the case of Pepe and Marcelo, just to outline the most proeminent ones. However, José Mourinho's men managed to keep a clean sheet last night, and this fact single-handedly is certainly worth of being remarked. It's the first time since December 1 (2012) where Real Madrid finishes a game without conceding a single goal (last time it happened the opponent was Atletico Madrid, in a home La Liga game at the Bernabéu). However, if that happened this Wednesday night, Iker Casillas surely deserves a big cut of the credit, as he ended up making a couple great saves during the 2nd half. The Merengues were expected to kickoff the game with a clear disposition to attack at full throttle and immediatly seek the opening goal. Similarly to what happened in the game against Real Sociedad, the hostilities were opened quite early in the game (3rd minute), but the man responsible this time was Cristiano Ronaldo and not Karim Benzema. The Portuguese legend picked the ball still close to the sideline on the left attacking side and simply fired one of his trademark shots, with his "knuckleball" unique technique. The result was a superb long range goal, who put Real Madrid immediatly on the lead of the game and the series. Both teams headed back to the locker rooms with the 2-0 on the scoreline and knowing that everything was still open to dicuss after the break. 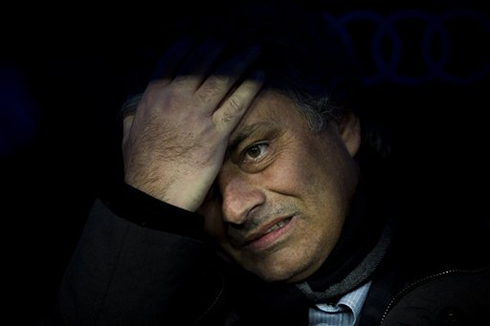 José Mourinho replaced Xabi Alonso with Varane, but moved up Essien into the midfield, in order to make room for the French youngster to play as a defender. That forced change ended up harming Real Madrid's dynamic in their midfield areas and as soon as the 2nd half started, the game changed significantly. Celta de Vigo was now threatning a lot more and dictating the tempo of the game at their free will. Thanks to a good performance from Iker Casillas, Real Madrid succesfully kept their goal inviolate, despite the Sergio Ramos sending off, close to the 73rd minute of the game. Celta de Vigo's pressure started to intensify as the 2nd half unfolded and it had to be Cristiano Ronaldo sealing the deal once again. The Portuguese foward doesn't cease to amaze every football enthusiast around the World and his third goal was another superb display of his physical power, strength and speed. With 87 minutes on the clock, CR7 made a sprint from his own penalty area, received the ball still 30 meters away from goal and after two short touches forward, he fired it with his left foot and made it go past Sergio Álvarez, for the third time on the night. The Santiago Bernabéu surrended to Cristiano Ronaldo's talent, ambition, attitude and physical power, with the home fans granting him with a standing ovation right after his hat-trick completion. There would still be time for a fourth goal though, with Sami Khedira making his way to also put his name on the scoresheet for the first time this year. The German midfielder received a pass from Cristiano Ronaldo, and then on his usual clumsy way, he striked the ball past Celta de Vigo's goalkeeper and right between a defender's legs. No more noteworthy incidents happened from that point onwards and Real Madrid finished the game with a 4-0 win, assuring the passage into the Copa del Rey quarter-finals, where they will face Valencia CF. Cristiano Ronaldo next game for Real Madrid will be against Osasuna, for the Spanish League 'La Liga', on January 12, 2013. You can watch Juventus live stream, Osasuna vs Real Madrid, Barcelona vs Cordoba, Manchester United vs Liverpool live streaming and Arsenal vs Manchester City live, all matches provided from our soccer live section.